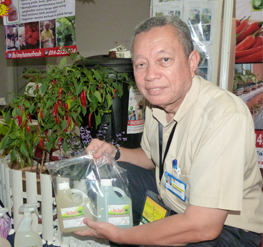 BANGI, 7 Dec 2012 – The genetic scientist who produced the crunchious variety of chilli, Cilibangi, Dr Ahmed Mahir Mokhtar Bakri has suggested city dwellers grow their own chillies in their own compounds. The first package involved a mini compost machine using food waste from the kitchen and the second package consists of a container filled with water and fertiliser which can be left in the compound of a house growing the chillies. The two packages and the production of two sauces of Cilibangi, pickles, fried anchovies and a few fertilisers and insecticides marked the second phase in the cultivation and marketing of Cilibangi, the crunchy and extra hot chilli, since its relaunch in Jun last year. Cilibangi is being marketed by Serotech Sdn Bhd, a start-up company of The National University of Malaysia (UKM). Serotech Chief Executive Officer, Dr Sharifah Nur Rahimah Syed Alias said it received offers of business tie-up opportunities from many parties for its ‘value added” Cilibangi. It successfully went into the venture to produce chilly sauce from red fresh Cilibangi from the farm which is suitable for fried chicken, mushrooms and other foods. The Dipping Sauce made from fresh green Cilibangi used a different formulation which is similar to sweet sauce and is delicious as a dip for tempura and keropok. The Cilibangi Pickles produced from green Cilibangi can be an added item when eating fried kway teow or fried mee. Three new bottled products under the Cilibangi brand are being produced in co-operation with Syarikat Global Agro Divesified Sdn Bhd. Dr Sharifah said: “we would like to encourage small and medium industries (SMI) that are using chillies in their products to switch to using Cilibangi. “Pia Ali Sdn Bhd, a SMI, have started to use Cilibangi in its products including Crunchious Fried Anchovies under its brand Pia Ali. “The sealed small container filled with the fried anchovies with Cilibangi paste is suitable to be brought along when travelling overseas like going for the umrah and haj and as an added food at boarding schools. “We have received orders from travellers and businessmen in Manchester, Britain; Paris, Korea, Egypt and Saudi Arabia,” she said. On the two DIY for growing Cilibangi, she said Serotech has forged a tie-up with Weimar Entreprise Sdn Bhd to encourage consumers to process their own organic compost using food waste from their own kitchen for use as fertilizer for their home gardening. “Left over food can be converted into compost in just four to five days compared to conventional methods which will take up from two to three months to produce,” she said. 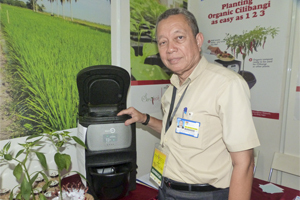 The Mini Fertigation Package at Home uses the concept “Grow, Leave and Pluck Cilibangi”. Serotech offers two packages in the MyHome Cilibangi programme: MyHome Cilibangi 1 consists of one set of mini fertigation system enough for 10 Cilibangi seedlings while the second package: MyHome Cilibangi 2 supplies up to 20 Cilibangi seedlings. Cilibangi a disease resistant chilli is the result of 30 years of R&D carried out by Dr Ahmed Mahir. Dr Ahmed Mahir obtained his Diploma in Agriculture from the then Agricultural College, Serdang (now UPM) in 1971 before getting his BSc (Crop Science) from the Louisiana State University, United States, in 1975. He obtained his Master’s (Crop Breeding) in 1977 and his PhD (Plant Resistant Breeding) from the Missouri-Columbia University, United States in 1981.